Tripled donations with every qualifying purchase! 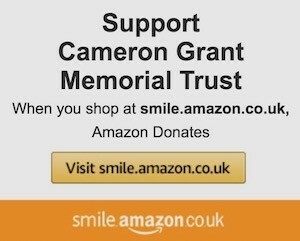 AmazonSmile is a way of donating to a charity – please choose Cameron Grant Memorial Trust! – while shopping at Amazon. Same shopping experience and prices for you, but Cameron Grant Memorial Trust also gets a donation of around 0.5% of what you spend. For a limited period only – 15 to 29 June – AmazonSmile is tripling its donation rate so Cameron Grant Memorial Trust will get around 1.5% of what you spend. Please choose to support Cameron Grant Memorial Trust by starting your shopping at AmazonSmile all the time, and especially from 15 to 29 June.